The Chicago Bar Association's Bar Show is an irreverent musical comedy revue parodying local and national political, sports, and showbiz figures, performed entirely by Chicago area lawyers and judges. 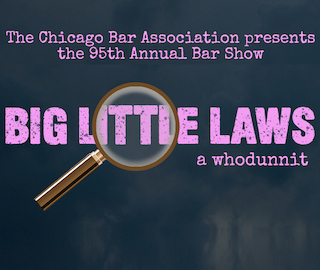 If you have a severe case of cable news-itis, the singing and dancing lawyers of the Chicago Bar Association have just the cure for you - the 95th Edition of the CBA's musical revue "Big Little Laws". You'll meet unreasonable facsimiles of Donald Trump, Rahm Emanuel and many more of your favorite celebrities and in this case the facsimiles are a lot more fun than the real thing! Friday, April 26, 2019 • 7:30 P.M.